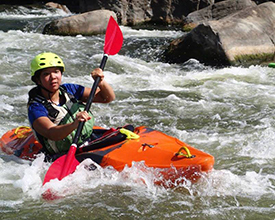 Hollins women have been learning leadership skills through outdoor adventure since the Hollins Outdoor Program began nearly four decades ago. HOP is an integral part of Hollins’ adventurous essence. The lineup of activities includes downriver racing, bouldering, trail hikes, bike rides, and much more. 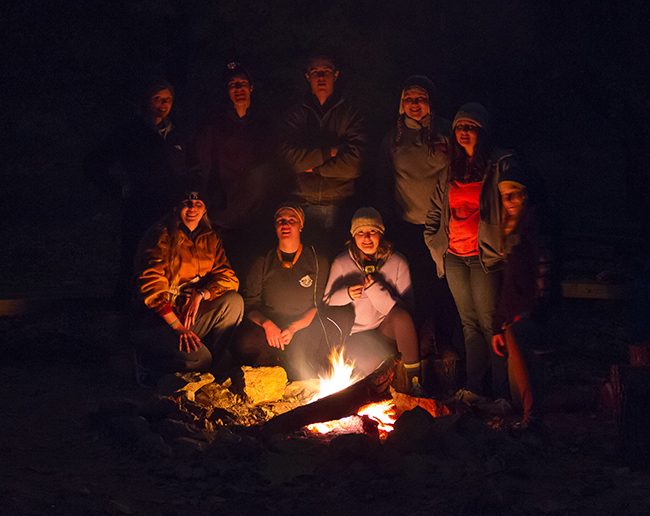 Since its founding in 1977, HOP has also helped students become leaders, discovering their potential—and their courage—on a climbing trip, while running rapids, or dealing with the darkness of a cave. In fact, forming leaders is something HOP does best: The women who leave the program are changed for the better, going on to do such things as becoming resident assistants on HOP Hall in West, receiving their outdoor leadership certificates, or helping run the Wilderness Orientation Program each summer for new students. Robinson completed a B.F.A. and post-baccalaureate certificate in dance and a Hollins Outdoor Leadership Certificate. After spending time as a unit manager at a Girl Scouts of America summer camp, where she assisted young women at outdoor adventure camps, she now works at Norfolk State University as a program coordinator for the Office of Leadership and Student Engagement. Robinson says that her time in HOP and the skills she learned in the program influence her daily life in her current job, especially in teambuilding exercises and workshops. 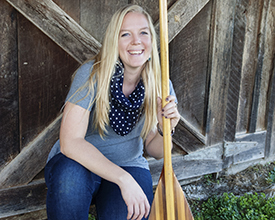 Kaila Thorn ’11, a double major in environmental studies and international studies, says that HOP helped her channel her passion for the outdoors. Her HOP experience, combined with training through the Batten Leadership Institute, helped her become a more active listener, a better leader, and a braver individual. HOP also exposed her to parts of nature that, as a Florida native, she had never seen. “I didn’t understand what white water was,” she says, but by the end of her time at Hollins she was on the downriver racing team and had, with Robinson, pushed for new boats for the team. 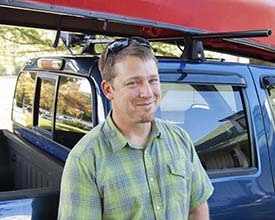 Thorn, who now lives in Charlottesville, Virginia, has since graduation worked as an environmental educator, raft adventure guide in West Virginia, and backpacking trip guide. She has led wilderness outings for autistic and learning-disabled children and hopes to pursue a graduate program that blends environmental studies and special needs education at the University of Pennsylvania. One of the most satisfying aspects of the HOP curriculum for Thorn was that “you can literally climb a wall and see your progress.” A student who can scale only the bottom part of the wall in autumn can, with the help and support of her peers and Jon Guy Owens, the program’s director, make it to the top by spring. This visible progress erases any doubt a student might have about her abilities; she can see herself making it up the wall, hand over hand, foot over foot. For Samantha Hopkins, “HOP expanded my comfort zone and grew my confidence by leaps and bounds. Confidence is something I have always struggled with and continue to struggle with to this day. Without HOP, I would not have felt I could be the president of the Outdoor Athletes Club.” Hopkins and Dovgan were coleaders of last summer’s Wilderness Orientation Program for new students, a five-day outdoor adventure that involved, among other activities, maneuvering a high ropes course and canoeing down the James River. Hopkins, an international studies major, says that Hollins taught her that leaders “communicate with and listen to people, inspire and provide direction and focus to the group, and bring both rationality and empathy and passion and emotion to the people they are leading.” She still holds on to the part of herself that used to run through the Virginia backwoods, but now she also can boulder, race downriver, and climb. Morgan Blalock, from Newport News, Virginia, is a double major in English (with a concentration in creative writing) and classical studies. She is the editor of Cargoes and a member of the Academic Policy Board. 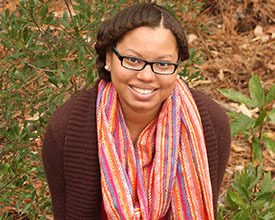 She served as the student success leader in the fall 2014 first-year seminar taught by Professor of History Joe Leedom. October 2011: First place, ACA Collegiate Race Series Virginia Championship. 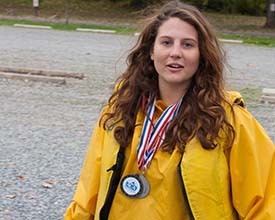 Mia McDonald ’12 and Tina DelPup ’12, who had competed in Hollins’ first competition in 2009, won the gold medal for tandem canoeing. April 2014: Third place, ACA Collegiate Race Series National Championships. November 2014: Second place, Women’s Championship competition, ACA Collegiate Race Series National Championships. The downriver racing series is a team event in which a group of paddlers compete in a series of individual classes that are two- to two-and-a-half-mile sprints down an introductory to moderately difficult white-water river. 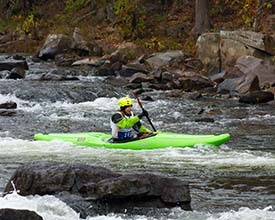 The classes consist of individual kayak and canoe, as well as tandem canoe categories. New in the last year is a flat-water stand-up paddleboard category, or SUP. Kayak: A fully enclosed boat, in which you sit flat with legs out in front and paddle with a double-bladed paddle. Competitors paddle solo in the race series. Canoe: An open-topped boat in which you sit on a saddle or on your knees and paddle with a single-bladed paddle. Competitors paddle solo or tandem. SUP: Stand-up paddleboard. Competitors paddle standing up.